Pictured is a portion of detoriating roadway on Pleasant Street in Mechanicsburg just north of East Sandusky Street. Portions of Pleasant Street, Walnut Street and Park Avenue are scheduled to undergo rehab as part of a project funded by the village’s share of the county’s permissive tax. MECHANICSBURG – Village Council learned Monday that the project to rehab portions of Pleasant Street, Park Avenue and Walnut Street has been awarded to Strawser Construction, Columbus. Village Administrator April Huggins-Davis said that prior to awarding the bid to Strawser in the amount of $74,492, the lower of two bids received (A&B Asphalt bid was $76,495), the village had to seek approval from the Champaign County Commission to use additional funds from the village’s share of the county’s permissive tax since the lower bid turned out to be over $5,000 more than the village’s engineering consultant, John Grosse of Stantec Inc., had estimated in August. 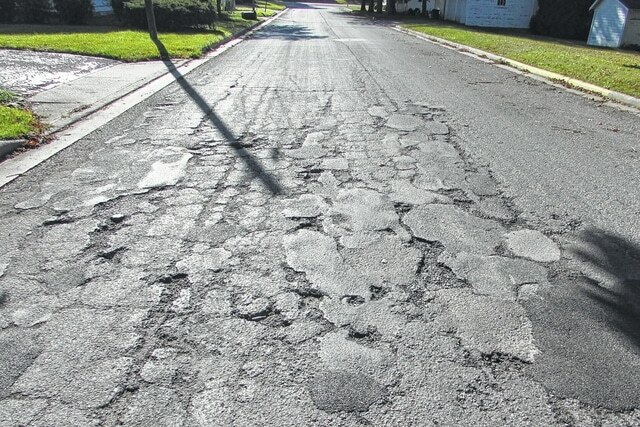 “(The Champaign County commissioners) sent me back a letter this week approving the additional $5,659.11 to make up the difference to get the street work done through the permissive tax project,” Huggins-Davis said. The funds can only be used for street repairs. Huggins-Davis added the village also owes an engineering fee of $3,200 to Stantec for preparing the plans and bids for the project. “Greg and I decided we could take that (money) out of the Street Fund rather than request additional money and let the rest of the permissive tax sit over there until our next project,” she said. Police Chief John Alexander spoke to council about a new book program the Mechanicsburg Police Department is sponsoring at Dohron Wilson Elementary. During the two-year program, the police department will sponsor books for first- and fourth-grade students. In other school-related news, Alexander said, Mechanicsburg Exempted Village Schools has changed the date of this year’s annual PTO International Walk to School Day from Oct. 7 to Oct. 14 at 8:30 a.m. The walk will begin at Goshen Memorial Park instead of the former IGA building, where it started in past years. “They changed the route this year because they are expecting 400 kids,” Alexander said, adding that along with his department, the Ohio State Highway Patrol and Mechanicsburg Fire & EMS will assist with the walk from the park to the school. •Since council’s Sept. 21 meeting, Alexander said, his department has been busy with drug raids. “We’ve had three of them, and all three were within 1,000 feet of the school,” he said. Alexander thanked Mechanicsburg Fire & EMS as well as Tri-County Regional Jail Executive Director Scott Springhetti for their help with the raids. •The Mechanicsburg Planning Commission has changed its meeting date to every other month with the next scheduled meeting to take place at 8 a.m. on Nov. 28. •Huggins-Davis informed council she and Alexander are scheduled to meet with Springhetti to see if the village can get a few individuals to help with leaf pickup, scheduled to start in the next few weeks. •The sewer plant project is expected to be completed by the end of the month, Huggins-Davis said. https://www.urbanacitizen.com/wp-content/uploads/sites/36/2015/10/web1_Mechanicsburg-street-repair.jpgPictured is a portion of detoriating roadway on Pleasant Street in Mechanicsburg just north of East Sandusky Street. Portions of Pleasant Street, Walnut Street and Park Avenue are scheduled to undergo rehab as part of a project funded by the village’s share of the county’s permissive tax.